Toast bread in toaster. Spread peanut butter on 4 slices bread, then spread nutella on remaining 4 slices bread. 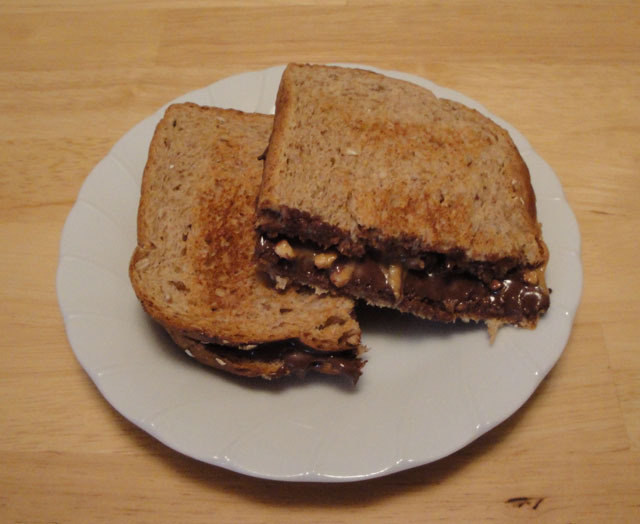 Place bread with peanut butter atop nutella. Enjoy! Hi, Christine! Following you from Get Your Blog Followers FB page... good to connect and hope you'll visit http://frugalfancy.com as well! Nice to see you hear. I'll be visiting you soon. I love nutella! When we lived in Italy 15 years ago, it was all over! Then when we returned to the states, we brought some back thinking we had the coolest thing....and it turns out it made it's American Invasion while we were over there! Happy Thanksgiving! I just love Nutella, interesting history on the company. Boy, does that look good. I love Nutella. My mom used to give us that on toast when I was young.Great sandwich, Christine. Enjoy your Thanksgiving Holiday. Look simple and good. Happy Thanksgiving to you..
Hi Christine, this looks like a terrific sandwich! Thank you so much for the story! I loved it! Delicious sandwich! Have a nice day Christine! I am VERY excited and honored to be awarded. I am so happy to think that you thought my blog was worth enough to award me. Thank you so much! I hope you had a wonderful Thanksgiving. I was really curious. Interesting! Happy Thanksgiving, Christine! This is one heavenly sandwich! This is my kinda sandwich! Looks AMAZING. This looks fun--I wonder about making it in panini form! We love jam and peanut butter sandwich. This nutella and peanut butter version should be another big hit for us!